Italian Heavy Metal band CRYING STEEL teams up with singer Tony Mills (ex SHY, ex TNT); new album “Stay Steel” to be released on PRIDE & JOY MUSIC on June 15, 2018! Crying Steel were founded in Bologna in 1982 from the ashes of the Hard Rock group WURDALAK. 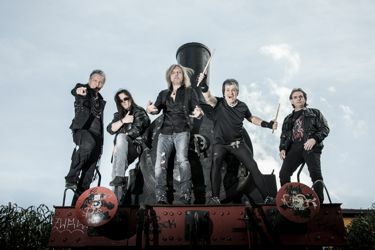 The founding members were Alberto Simonini (guitar) and Angelo Franchini (bass), who were joined by Luke Bonzagni (vocals) and in 1983, and after various line-up changes, by Luca Ferri (drums) and Franco Nipoti (guitar). After a couple of demos, the Italians released their debut EP “Crying Steel” in 1985. During the next two years the group intensified their live activities throughout Italy including a performance at Heavy Metal Festival in Bologna in June 1986 with Motörhead and Twisted Sister. After more demo and promo releases, the debut LP “On The Prowl” came out in 1987. This was a revolutionary album - at least for the Italian New Wave of Heavy Metal (NWOIHM), as it was the first to be also released on CD. In September 1988 the line-up changed again. Simonini and Bonzagni left Crying Steel and were replaced by Michele Vanni and Lisa Bisognin. In March of 1990 Michele Vanni also left when Francesco Di Nicola joined the group. In the same year, the band performed some gigs in Russia with Massimiliano Merlini as new singer in the line-up. Some more gigs followed in 1994 and 2003 - reunions which saw Crying Steel perform with the classic line-up (Simonini / Grandchildren / Bonzagni / Franchini / Ferri). In 2006, Crying Steel were signed by Italian label My Graveyards Production and began to record the new record “The Steel Is Back” which was released in 2007. Shortly after the album came out, Simonini unfortunately decided to leave the group. Max Magagni stepped in for the release party. Luca Bonzagni then had to leave the band due to differences with the other members until Crying Steel announced their new singer Stephen Palmonari in November 2009. Another series of concerts followed and included a performance at the British Fest. The follow-up album, “Time Stands Steel”, was released in April 2013. In June 2013, Crying Steel parted ways with singer Palmonari who was immediately replaced with Ramon Sonato and Luigi Frati. Before the concert held in Reno in February 2014, Friars Luigi replaced Max Magagni who had to leave due to increasing work commitments. After this line-up change, the group intensified it’s touring schedule once more and also represented Italy at Wacken Open Air’s 25th Anniversary. In 2015, they played the Greek festival "Metal Rites" in Athens with Jag Panzer and signed a record deal with local label No Remorse Records before playing with former Iron Maiden singer Blaze Bayley in 2015. In 2016, Crying Steel celebrated their 30th Anniversary with a live show at Lokomotiv Club in Bologna with their friends Rain, Markonee and later on supported the American band Riot. A special box set containing a reprint of "On The Prowl" + a DVD with the performance at Wacken Open Air 2014 was released in 2016, and Mirko Bacchilega became the new singer. 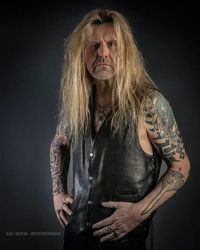 In 2016, Crying Steel announced that the coming studio release will feature Tony Mills (Shy, TNT), one of the greatest voices in the international rock scene, on vocals. Crying Steel also played Paris Metal Fest in 2017.